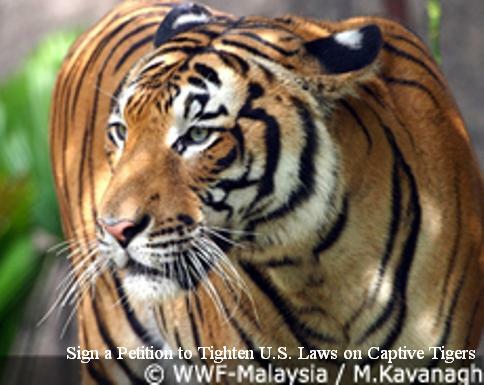 Help WWF tighten regulations to protect captive tigers in the U.S. and prevent increased demand for tiger products that put wild populations at risk. Sign WWF's petition to Secretary of Interior Ken Salazar and Secretary of Agriculture Tom Vilsack asking them to use their authority to close existing loopholes in the permitting and monitoring of captive tigers in the U.S.
At present, there is currently no way to determine how many captive tigers are in the U.S., where they are, who owns them, or what happens to them when they die. This makes them an easy target for black market sales, stimulating demand for tiger products and further theatening wild populations by putting them at increased risk of poaching. Join our petition asking the U.S. government to close the existing loopholes and require registration and monitoring of all captive tigers. Tx2 = WWF’s goal to double the number of wild tigers by 2022, the next Year of the Tiger.